Hotmail is often seen as the first virally marketed product on the web. The web-based email provider launched in 1996 and was acquired by Microsoft 1.5 years later. By then, the service had amassed more than 8.5 million users. At that time around 70 million people used the internet. How did Hotmail spread among 12% of internet users in such a short time period? 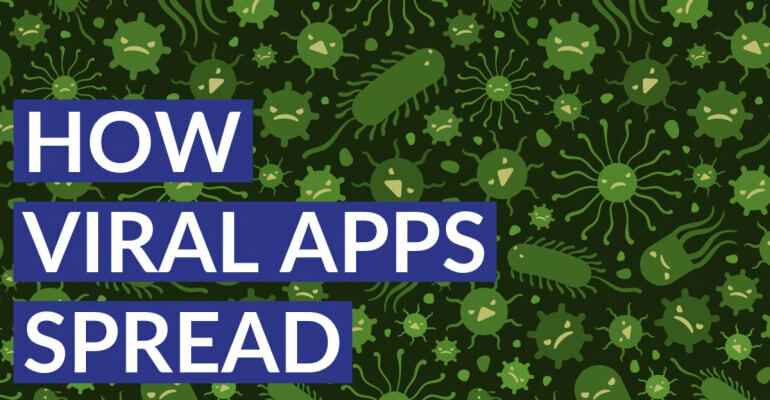 An idea that spreads like a virus is important for creating a successful app. Some say it’s crucial, even. An app can’t succeed if it’s not viral. The best app ideas have virality built into them. When you sent email with Hotmail, the email client would include a single line at the bottom of the email: “Get your free email with Hotmail”. The word Hotmail linked to the service’s home page, which explained how it worked. Imagine that you send emails to 10 of your friends. Thanks to that single line at the bottom of your email those 10 friends now have the opportunity to become Hotmail users. This is how viral ideas spread. That’s not all… At the time, the concept of web-based email was very novel. Everyone had one paid email address provided by their ISP. You could typically use those only from your home PC. Hotmail was free, you could access it from anywhere in the world, and you could get an extra email address at no cost. The service gets better when your friends use it, because you can communicate more reliably with each other. When I recommend Hotmail to you, and you start to use it and like it, I grow in status. Friends recommend friends good stuff. In 1996 the internet counted only ~ 250.000 websites. Make that 1.1 million in 1997. These days, there are more than 4 million apps. Does that change how we think about virality? The basic principle of viral marketing is still the same. What is it about your idea that makes people tell other people about it? With 4+ million apps, the App Store is very crowded right now. It’s almost impossible to stand out naturally. You can’t just build an app, publish it, and get noticed by a lot of people. Who is my app for and what problem does it solve for them? How can I understand my potential customers well enough to be able to build a product for them? How can I attract a small following of true fans who can support my efforts, spread the word and provide feedback? There’s no point in creating yet another social media app in the hopes of it spreading virally. Unique ideas are equally bad too. You don’t want your viral marketing to be superficial either. Over 50 million people reportedly downloaded Flappy Bird. How many of them still play it – and spread the word – today? Let’s look at a current day example: Bear. It’s a note-taking app for Mac and iOS. You can use it to journal, collect notes, write prose and even for coding. The app is beautifully designed. Apple named it App of the Year 2016 and it recently got the 2017 Apple Design Award. Before the app was published in the App Store, it was “in beta” for a long time. Shiny Frog, the app’s creators, listened to feedback from their bearapp subreddit and implemented it ruthlessly. During their beta period they slowly grew a following of loyal fans. The fans were enrolled in the process – which is crucial. Can you imagine what those true fans did when their beloved app finally got released publicly? See how those things come together? You create an app worth spreading. You enrol people in the process and grow your fanbase. You create an environment in which we all benefit when we spread the word about your app. It’s almost impossible to create a viral app intentionally. What you can do, is nudge your idea in the right direction. Find a medium you can use to enrol people in the process of creating your app. How can you best listen to them and report back? When you’re well on your way – what is it about your app that makes people tell other people about it?